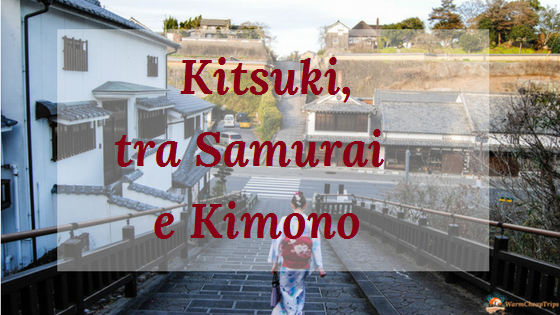 In this article I want to bring you into the fascinating ancient Samurai world through the explanation of their legendary sword, the now famous, even in the West, Katana. Everyone knows that the Katana is the Japanese sword and its main characteristic is to be bent and have only one thread (only one sharp edge), but there is much more to know about this sword, considered by many to be the perfect sword . The first Japanese sword-makers were Buddhist Tendai monks or mountain warrior monks called Yamabushi. They were alchemists, poets, writers, fighters considered unbeatable and blade-makers, had vast knowledge and for them to forge a blade constituted a real ascetic practice. Subsequently, with the explosion of the Samurai epic, in many cities and villages, the best smiths became katana molders. In Japan the production of swords was not just a job, therefore, but rather an art with a spiritual meaning, and the best producers of Katana in the various eras of Japan were considered almost like the Samurai, despite their manual work, as a craftsman, consequently certainly not worthy of the Samurai nobility acquired only by right of birth. 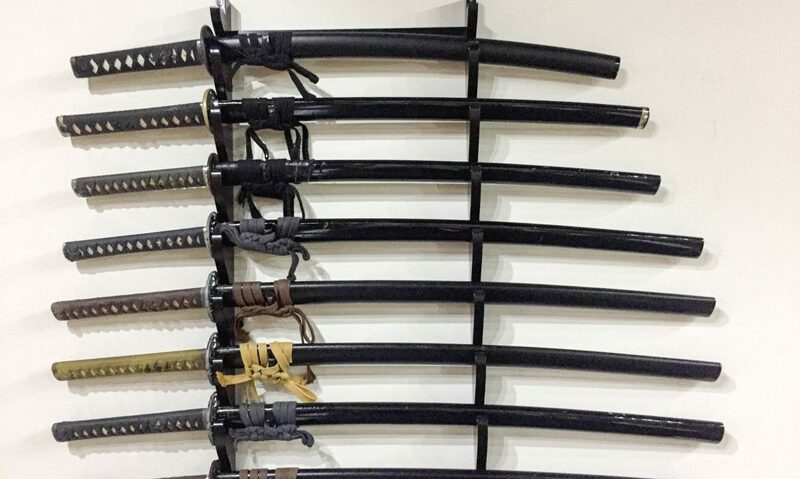 The production of a single Katana could also take 6 months of work and was divided into many different phases, and not all performed by the same craftsman. Nowadays in Japan still survives some ancient forge of Katana, generally managed by descendants of the ancient masters, they are Japanese National Heritage and also receiving subsidies from the state to preserve such as important and characteristic art of Japan. One of these forges in which the Katana are forged following the ancient systems is located in the southern island of Kyushu, in the small town of Arao of the prefecture of Kumamoto and is managed by the master Matsunaga Genrokurou. 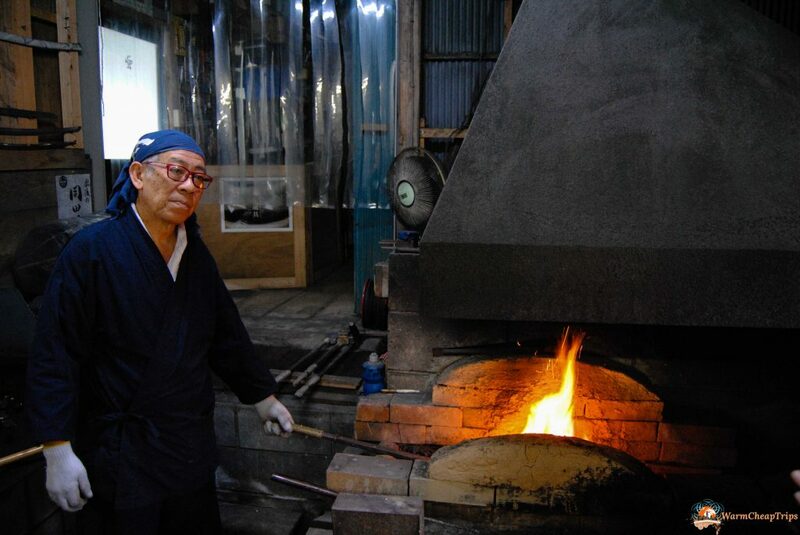 Master Matsunaga is not descended from a family of producers of Katana, but his strong passion for the history of his country and its traditions led him to resign from his job to undertake a long apprenticeship with a renowned teacher, then, once acquired all the knowledge, he opened his own forge in traditional style. Thanks to the help of a Japanese friend we were able to contact him and make an appointment to visit his forge and listen from him the secrets of these formidable swords. The origin of Katana is not certain, the most accredited theories are those that see it as a variation derived from a Chinese sword and that according to which derives from the sword typical of Ainu, the indigenous polpolazione of Japan, which over the centuries, after continuous defeats military, has been confined in the extreme north of the country by the current Japanese. There are various types of sword in Japanese history (in fact the main differences regard their length and curvature), but the most important and famous is undoubtedly the Katana. Although it allowed to store effectively, the katana was used mainly to hit with slashes, so its best quality was to cut, for this reason it was given the characteristic curved shape, unlike the classic straight western swords, used more to store or shatter. The golden era of the development of this sword is the Kamakura period (1192-1333) of Japanese history, that is the period in which the figure of the Samurai that everyone knows begins to emerge, imposing itself not only as a figure of an elite warrior but also as a noble class, cultured and dominating the whole country, against an old aristocracy now too far from reality and devoted only to the pleasures of the court. 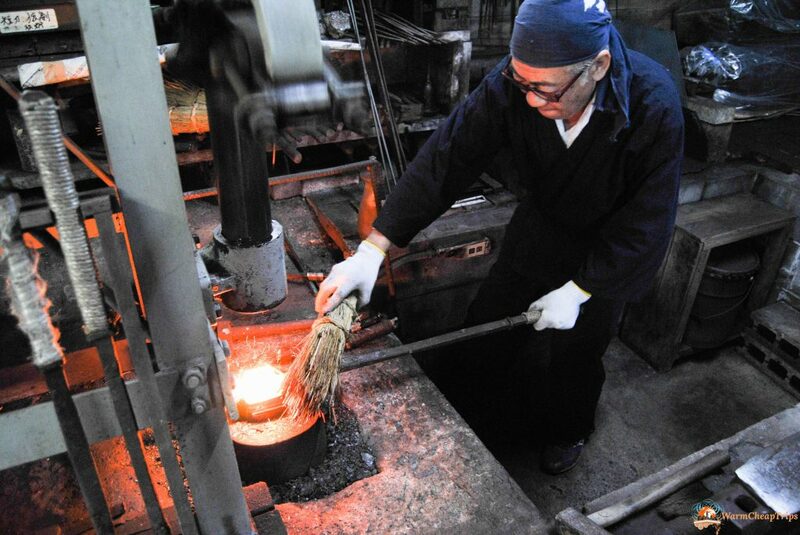 In this period of strong militarism, the production technology reaches unprecedented levels and, in correspondence of 5 large mining areas, there is the appearance of the famous five schools of forging of Katana, namely: Yamashiro School (Kyoto), Yamato School (Nara ), Bizen School (Okayama), Soshu School (Sagami), Mino School (Seki). During this period the figure of the Samurai was affixed, as opposed to the tradition, until then, of the infamous Samurai archer on horseback. It was exactly for this change of course in the style of fighting Samurai passed from Tachi to Katana. The Tachi was nothing more than a longer Katana designed to be used as a horse against infantry or other mounted Samurai. What defined the condition of Samurai was not only the Katana, but the Daisho, or the couple Katana and Wakizashi. The Wakizashi was also a kind of Katana, but this time shorter, suitable for fighting in narrow spaces like bush or inside buildings. Another peculiar characteristic of Katana is to have only one thread. The Japanese Katana was generally used with 2 hands, this prevented the possible use of shields or protections, therefore it was the Katana herself to act as a shield. On the one hand we find the extremely sharp thread, but on the other hand the Katana is much thicker and more robust; this side was in fact used by the most skilled warriors as a sort of shield to ward off adversary blows without ruining the thread of one’s sword. Exception to this style of use of the Katana was the great Samurai / Ronin Miyamoto Musashi, who, endowed with an extraordinary physical strength and attitude to the duel, founded his own school of fencing called “Hyoho Niten Ichi Ryu” (still existing in Japan and also abroad) which included the combined use of Katana and Wakizashi. Musashi’s philosophy held that he had neither any sense nor honor to die with a sword still sheathed. Katana was not simply a sword, it was considered the mirror of the Samurai soul. For this reason, a Samurai never separated from his sword and took care of manic levels, constantly taking care of every detail and also investing a lot of money for its maintenance in the best conditions. It was also believed that a Katana had the peculiarity of absorbing the spirit of its daring owners, which is why, more a sword was ancient, more it was considered powerful and valuable. In the 16th century, in Japan there was what was called Sengoku Jidai (Warring States Period), a historical period from 1467 to 1600 (simplifying). Towards the end of this era there followed three great Samurai leaders who will go down in history as the 3 unifiers of Japan. Under the reign of the second of these unification, Toyotomi Hideyoshi, some laws were passed (1587 and 1591) that would create a very rigid division into castes that would last for 300 years. One of the main points of this new law enshrined the absolute prohibition, for any person not born Samurai, to bring the Daisho, or any other weapon, and at the same time the absolute prohibition for the Samurai to engage in any other type of work that does not they were war and training, or activities worthy of the noble / warlike class such as meditation, poetry, sculpture, garden design, the art of tea and others. It was in this period that Katana conquered that legendary state that still distinguishes it today. During the following period (Edo Jidai), the country was now unified and relatively peaceful; the wars were then replaced by duels. It is in this context that the adventures of the solitary samurai who wander through Japan are inserted, accompanied only by their Katana, in search of their true strength and Buddhist enlightenment, in order to become the strongest swordsman in the country, and obtain therefore glory and honor and come perhaps assumed as masters of arms in the great Samurai houses or even from the Shogun (this type of history is a very recurring theme in many Japanese Manga). Once again I have to mention Miyamoto Musashi, as he is probably the greatest exponent of this era, thanks to his countless victories and to his book “Gorin no sho” (“The Book of the 5 Rings”) which has come down to us, in which he tells details of his adventure and his secrets both technical and especially mental to win in war and in duel (just think that this book is still studied by managers of Japanese companies as a manual to excel on the adversary). Taking a big leap forward, not to go too far, we reach the years of the Second World War. The Samurai caste had been abolished in 1877 as a result of internal wars between traditionalists and modernists, who saw the victory of the latter. These conflicts broke out because of the arrival of modern American warships in the Japanese archipelago, which immediately made clear the sharp technological inferiority of a country such as Japan, which had come from almost 300 years of complete isolation from the outside world. This situation has made clear the fact that in order to defend itself from the advance of Western colonialism, and not to end the Chinese Empire for example, Japan had to adapt and learn as much as possible American and European production and development techniques. The country then started towards a new era (Meiji restoration), which in less than 30 years will lead it to be the first non-Western nation to militarily defeat a Western power (Russia 1905). Then made room for the rise of a modern Western-style army, no more bows and arrows, but guns, cannons and warships. 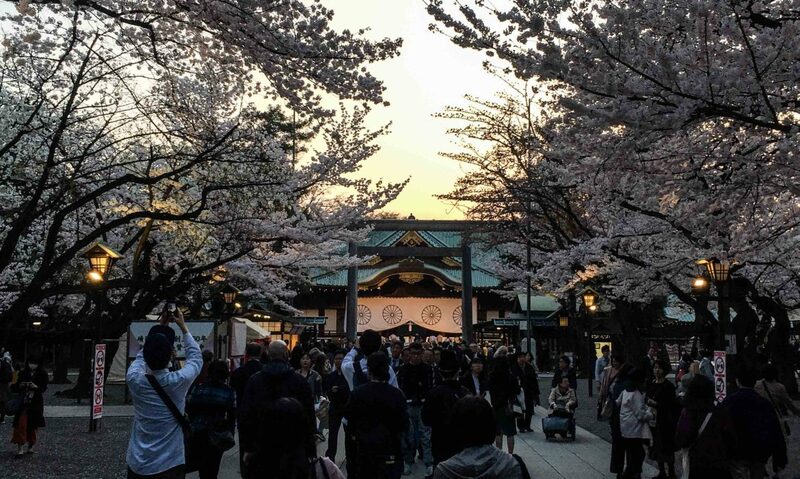 Japan is, however, a country that changes only when it is forced to do, and now the Samurai were anachronistic, but even when it changes, it always maintains its tradition firmly, not replacing it with the new, but merging it together. It is therefore not surprising to learn that during the Second World War, not only the Japanese officers, but also many soldiers, came down on the battlefield with a Katana on their side, and in most cases they used it in suicide against the overwhelming allied firepower. These swords, however, now had only the appearance of a Katana, but in practice they were pieces of steel of low quality and mass-produced; the needs both in the number and in the speed of production were now totally different. 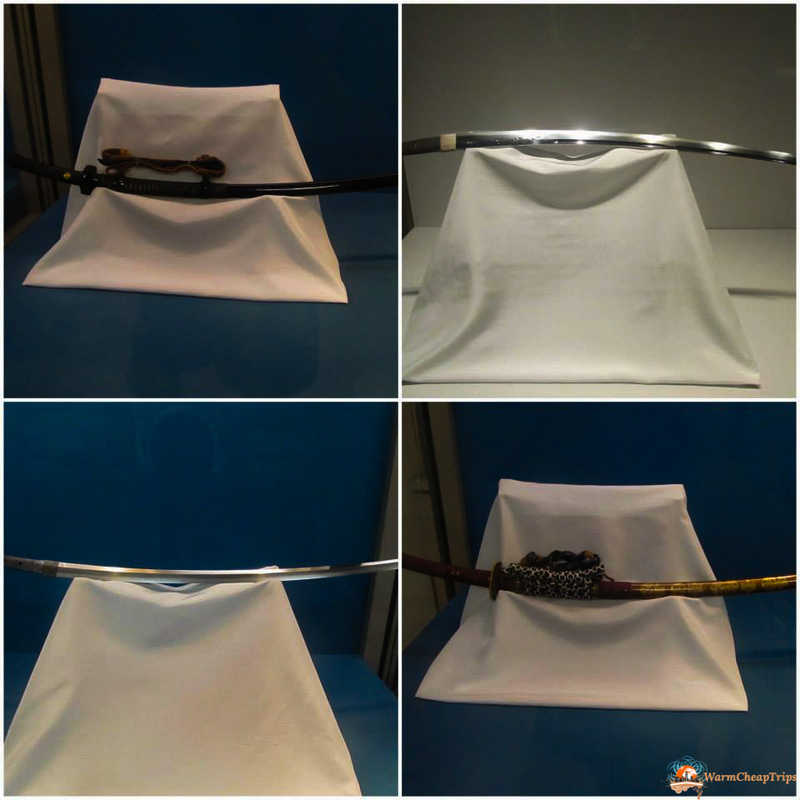 Nevertheless, these swords had a huge impact on the morale of Japanese soldiers, making them feel the bond and the contiguity of the tradition with their legendary ancestors, from whom they also took the code of honor, the Bushido. After the tormented years of the last world war, and after the end of the American occupation of Japan (1952), the ancient art of the production of Katana was brought back thanks to the passion of the descendants of the old masters and from what remained of the ancient schools, until nowadays and “our” Master Matsunaga Genrokurou. Arrived by train from Kumamoto at the village of Arao, which has about 20,000 inhabitants, and is constantly aging due to the emigration of young people to bigger cities and greater opportunities, we immediately realize that we are in another Japan, not the usual we are used to, that of huge cities, lights and technology; here we are in the heart of Kyushu, in Japan of the countryside and traditions (not that in the big cities there are, but, here it is … different). We reach by bus (thanks to google maps) the house / workshop of Master Matsunaga who greets us warmly, but also appears quite intrigued; I do not think I often get visits from Westerners. Along with him there are two other men of about sixty and a woman of about forty, all 3 are experienced martial artists and are training for a demonstration that will hold during the Matsuri (Japanese party) next weekend. After the first pleasantries, the Master takes us to his forge, where he has already prepared various Katana for us at different stages of processing. All the work takes about 2 months, so this is the only way to give us a general idea of ​​the whole procedure, which we now summarize. Let’s start by analyzing the main material that makes up the blade of a Katana. It is a block of rough steel iron with variable percentages of carbon, based on the desired result and composed of a large quantity of coal, fragments of iron fused in a furnace. The resulting molten steel compound is then collected in a suitable container and transformed into a cubic steel block. One of the most important features of Katana is the incredible number of layers of this iron of which it is composed. This raw material, after having been suitably worked, is in fact subjected to a large amount of bending and hammering, in order to give great resistance and at the same time flexibility to the blade. This feature is also made possible by the use of 2 different types of steel, one soft and one hard, which form a more flexible inner core and a stronger external thread and back. The blade was supposed to be as strong as possible so as not to chip or break too easily, but its trump card was at the same time its great internal flexibility, which allowed it to cushion the blows and the vibrations caused by it. 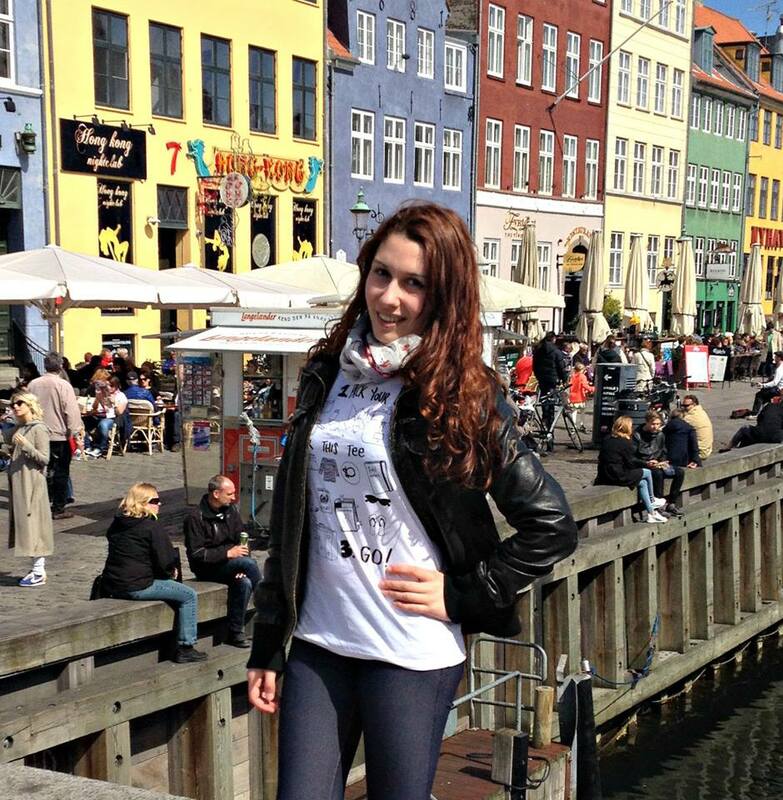 in the event of exaggerated rigidity they could easily have it shattered. To each of the folds to which the Katana is subjected, the number of its layers doubles, up to the maximum threshold of 32768 layers, beyond which it is useless, if not impossible to go, since the maximum resistance level has now been reached. Possible flexibility, and adding more layers would not improve the final characteristics of the blade. This layering is able to make the blade so hard to make sure that not even direct hits on the armor or on another sword damage it. On the Internet there are even videos of modern Katanas that, fixed on special blocks that keep them still, are able to cut into 2 projectiles fired against them by guns and rifles. The extreme hardness also allows you to sharpen a very fine and therefore very sharp wire without making it too fragile. A difference between the present construction method and the original one is surely the aid of hammering machines that make the work less trying for the Master. Once the stratification phase is over, we move on to give this block of iron and steel the shape of a Katana, defining the length and shape of the tip. This is also the phase in which hardening is carried out, ie the phase in which the blade is sprinkled by different types of clays with different properties in relation to the high temperatures, so that, through a heating process, until it becomes the incandescent blade, and subsequent cooling in water at a temperature of 37 ° C, this differentiated tempering will help to form a blade from the extremely hard wire and back and a more flexible inner core. It is also during this phase of rapid cooling that Katana naturally acquires its typical curvature. At this point, the work of the forgers is over, the sword will now pass to other masters who will take care of the sharpening, polishing, decorations, grip and scabbard. 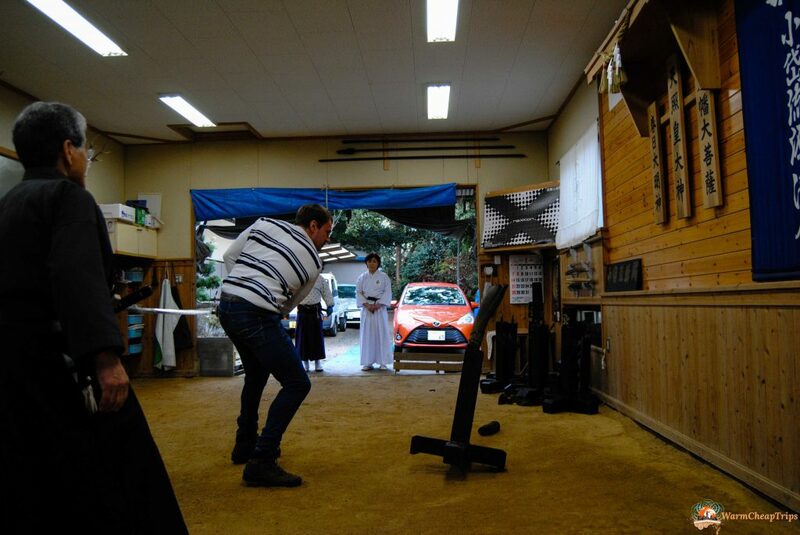 After visiting the workshop and giving us all this information, Master Matsunaga invited us to attend the training of the 3 experts we talked about before, let us try the experience of challenging and using a real Katana, even if modern. Today the Katanas in their true form, not of wood, bamboo or other materials, are still used in some Japanese martial arts. Let’s see what they are. 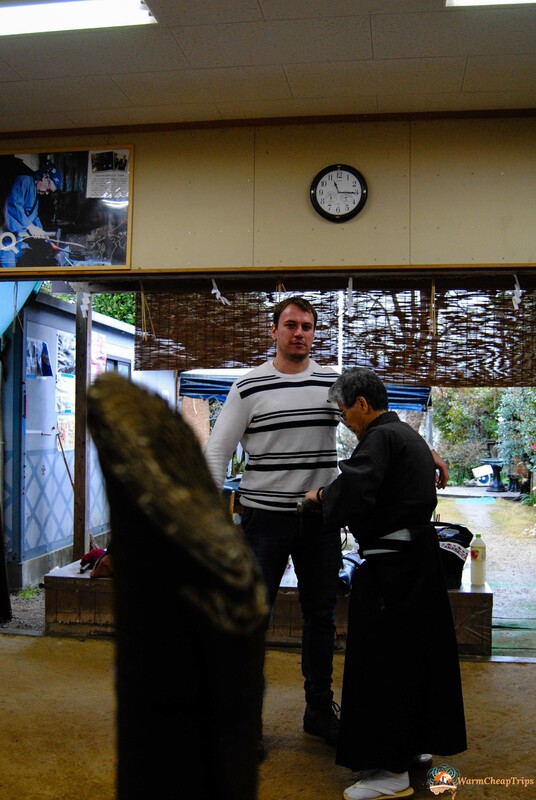 One of the most important is certainly Iaido or Iaijutsu, a Japanese martial art, influenced by Zen doctrine. The Iaido concentrates its studies on the extraction of the sword from the scabbard and on the subsequent first stroke, or at most the first exchange of 2 hits. This was a fundamental art for the Samurai during a duel because, generally, given the extreme precision of their technique and the effectiveness of their Katanas, the duel did not exceed the first exchange, because of the death of one of the two warriors , and sometimes both. The essence of Iaido is that of acquiring such a mastery of oneself and of the sword, from “Winning with the sword in the sheath” (Yagyu Munenori), or making the opponent perceive how big his strength is so much that he induces him to surrender before still starting the duel. Another very important art is that of Tameshigiri, or the cut with Katana. Once, to prove the validity of a Katana, they were taken slaves or prisoners, or corpses, and cut cleanly in 2 with a single blow. Fortunately, this practice has now been replaced by the use of bamboo, rice straw, tatami rolls and thin aluminum plates that make up a block of the same consistency of a human body at the level of the rib. Finally, Kendo or Kenjutsu is a Japanese martial art that brings together all the techniques put in place by the Samurai during their battles and duels. Unlike the Iaido, in this martial art all the techniques are carried out by the sword already extracted from the scabbard. Although at a competitive level the Kendo provides the use of armor and bamboo swords, demonstrations and training of Kenjutsu’s most experienced practitioners are held with true Katana. Since the fall of the Samurai caste, the study of Katana has acquired a purely inner value, becoming, like the study of the arc, an introspective research tool closely linked to the practice of Zen Buddhism. Because of this evolution in the martial arts function, no longer focused on defeating an enemy, but rather on defeating oneself, kenjutsu and iaijutsu evolved towards kendō and iaidō. Jutsu = Technique / Do = Way. Grateful to have had the opportunity to make this interesting experience, we greet the Master and all others who have lent themselves to teach us as much as possible on this sword, a true cultural heritage of Japan, and resume our journey to discover the Kyushu. The traditional constructive process of the Katana is still handed down from generation to generation, from the master forger to the student forger. Soon even Master Matsunaga will have to find an heir to whom he can pass on his knowledge and keep alive the tradition, maybe I could propose myself to him!